Apr. 13, 2017 – Mayor Walter Sendzik and members of the Mayor’s Invitational Golf Tournament organizing committee have made a $50,000 donation to the Hotel Dieu Shaver Health and Rehabilitation Foundation. The donation of proceeds of the 2015 and 2016 golf tournaments will go towards a new virtual fitness centre for physical rehabilitation assessment and therapy at the Hotel Dieu Shaver Health and Rehabilitation Centre in St. Catharines. “I have seen the specialty healthcare and compassionate services that patients receive at Hotel Dieu Shaver. Through rehabilitation and complex care, lives are truly transformed and I’m very proud to support their work to help patients return to enjoy healthy and active lifestyles. Thank you to our golf tournament partners, sponsors, and supporters for contributing towards this donation,” stated Mayor Sendzik. The new virtual fitness centre houses aerobic exercise equipment for Parkinson’s, stroke, multiple sclerosis and amputee patients. It includes a virtual forward-motion experience, designed to enhance a patient’s cardio workout with videos of beautiful locations around the world to turn indoor exercise into an outdoor adventure. Virtual reality based training is designed to help patients return to the community faster by increasing the efficiency of their therapeutic program. The effects of aerobic exercise training have been proven to decrease symptoms and increase motor function in patients with Parkinson’s disease in particular. Hotel Dieu Shaver Health and Rehabilitation Centre CEO Jane Rufrano accepted the donation on behalf of the Centre and the Hotel Dieu Shaver Foundation. 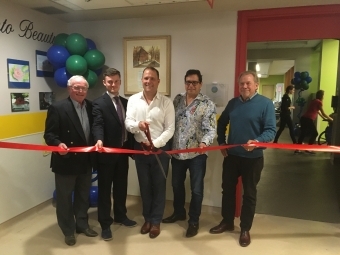 “Hotel Dieu Shaver is incredibly lucky to have generous supporters like Mayor Sendzik and the committee who understand the pressures that organizations are under to provide the best care possible to its patients. The funds donated from the Mayor’s Invitational Golf Tournament have built a space where our patients will gain mobility, strength and confidence to return back to the community and live happy and full lives with their newfound skills,” said Jane Rufrano. The Mayor’s Invitational Golf Tournament is an annual fundraiser held by the sitting mayor of St. Catharines with the support of an organizing committee to plan and fundraise for the event. Recipients of the tournament proceeds include local charities and non-profit organizations. Previous recipients include the Pathstone Foundation, the Niagara Health System Its Our Time Campaign, the Kristen French Child Advocacy Centre, the Niagara Children’s Centre Foundation and more. The 2017 tournament will be held on Monday, July 24 at the St. Catharines Golf and Country Club.